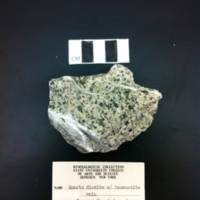 The sample color has a cream colored matrix with dark green phenocrysts. The sample contains Laumontite, which is a mineral in the zeolite group. There is a white talc-like substance on upper part of sample. 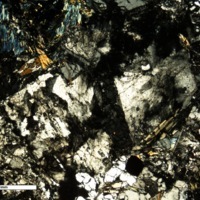 Phenocrysts are medium to coarse grained ranging from 1~8mm in length. There are multiple fractures that span the length of the sample. Some of the fractures are filled in with a white talc-like powder. The sample has an overall rough texture. 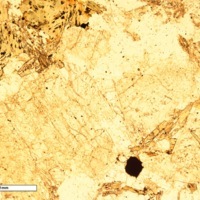 Small fractures are evident within the thin section. There are some blue minerals that have a birefringence of 0.004, that are biaxial (-). It somewhat swirls. The white talc like filling found in the fractures of the sample is made up of calcium, aluminum, silicon, and oxygen--this substance could be the Laumontite. 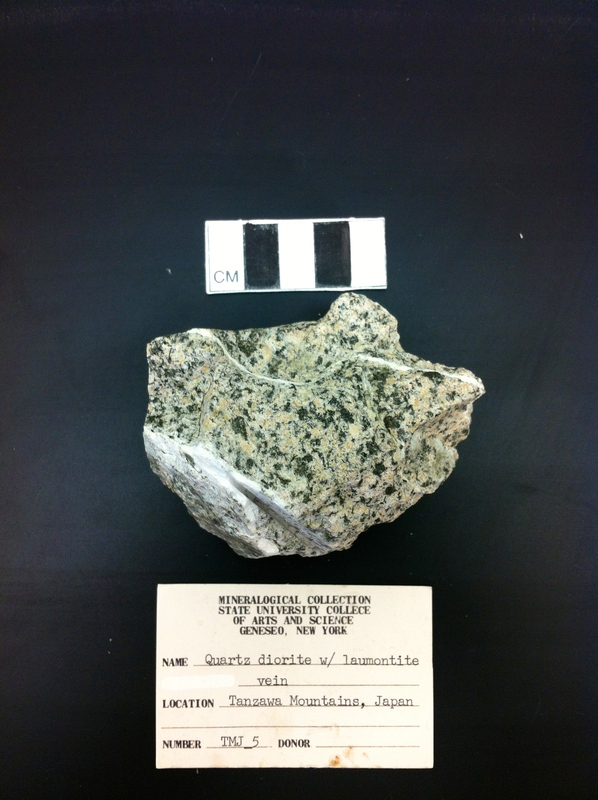 “Quartz Diorite with Laumontite Vein,” Geneseo Geoscience Collections, accessed April 25, 2019, http://www.geosciencecollections.milne-library.org/items/show/340.